My apologies to readers for not posting this information sooner. There has been an inconsistency between schedule information for a major project on the west end of the Queen line between the TTC’s five-year plan taken from their capital budget, and the City of Toronto’s Transportation Services plans. The TTC still has not provided updated information to resolve this although it was requested some weeks ago. The five-year plan for streetcar track renewal was part of the 2016-2020 Capital Budget. Whether all of this work will actually occur as planned remains in doubt because the relevant budget lines are subject to limitations on capital spending imposed by Council. The notes in the plan above show the changes in 2016 from the version in the 2015 budget. With this plan, the TTC has reached a “steady state” replacement plan for track thanks to construction of more robust infrastructure including new track foundations, the use of steel ties, and a return to continuously welded rail strings with thermite welds where needed. Special work is now laid in panels and, like the tangent rail, is better welded so that intersections do not fall apart only a few years after they are installed. The major changes for the new schedules effective March 27 involve routes where new express services will be added. A new service, the 185 Don Mills Rocket, will operate weekdays until mid-evening, and weekend daytime. The combined service at express stops will improve over current schedules, while service at local stops will decrease. Northbound: Buses stop only at Cosburn Avenue, Thorncliffe Park Drive (west leg), Thorncliffe Park Drive (east leg), Don Mills Road/Gateway Boulevard (south leg, north side), St. Dennis Drive (Ontario Science Centre), Eglinton Avenue East, Green Belt Drive, Lawrence Avenue East, York Mills Road, Graydon Hall Drive, Parkway Forest Drive, Don Mills Station, Van Horne Avenue, Finch Avenue East, McNicoll Avenue, Steeles Avenue East, Freshmeadow Drive/Don Mills Road. Southbound: Buses stop only at McNicoll Avenue, Finch Avenue East, Van Horne Avenue, Don Mills Station, Havenbrook Boulevard, Duncan Mill Road, York Mills Road, Lawrence Avenue East, Barber Greene Road, Eglinton Avenue East, St. Dennis Drive (Ontario Science Centre), Overlea Boulevard/Don Mills Road (west side), Thorncliffe Park Drive (east leg), Thorncliffe Park Drive (west leg), Cosburn Avenue, Pape Station. Route 139 Finch-Don Mills will be discontinued. Route 199 Finch Rocket will be extended west to York University weekdays during the daytime and early evening, and east to Morningside Heights during peak periods. The 39C Seneca College branch will be extended east to Gordon Baker Road. Eastbound: Buses stop only at Murray Ross Parkway & Busway, Dufferin & Finch, Bathurst Street, Finch Station, Bayview Avenue, Leslie Street, Don Mills Road (farside stop), Seneca Hill Drive, Victoria Park Avenue, Pharmacy Avenue, Warden Avenue, Birchmount Road, Kennedy Road, Midland Avenue, Brimley Road, Finch & McCowan, McCowan & Sheppard, and Scarborough Centre Station. Southbound: Buses stop only at McCowan & Sheppard, Finch & McCowan, Brimley Road, Midland Avenue, Kennedy Road, Birchmount Road, Warden Avenue, Pharmacy Avenue, Victoria Park Avenue, Seneca College, Don Mills Road (farside stop), Leslie Street, Bayview Avenue, Finch Station, Bathurst Street, Dufferin & Finch, Murray Ross Parkway & Busway, and The Common. Eastbound: Buses stop only at Bayview Avenue, Leslie Street, Don Mills Road (farside stop), Seneca Hill Drive, Victoria Park Avenue, Pharmacy Avenue, Warden Avenue, Birchmount Road, Kennedy Road, Midland Avenue, Brimley Road, McCowan Road, then all local stops east of McCowan Road. Southbound: Buses stop at all local stops to McCowan Road, then stop only at Brimley Road, Midland Avenue, Kennedy Road, Birchmount Road, Warden Avenue, Pharmacy Avenue, Victoria Park Avenue, Seneca College, Don Mills Road (farside stop), Leslie Street, Bayview Avenue, and Finch Station. A new service, the 188 Kipling South Rocket, will provide an express service to Humber College Lake Shore Campus weekdays during peak and midday periods. Northbound: Colonel Samuel Smith Park Loop, Colonel Samuel at Humber College Building M, Colonel Samuel at Lake Shore Boulevard, Kipling at Birmingham, Kipling at Evans, Kipling at The Queensway (farside stop) and Kipling Station. Southbound: Kipling Station, Kipling at The Queensway (far side stop), Kipling at Evans, Kipling at Birmingham, Kipling at Lake Shore Boulevard, Colonel Samuel at Humber College Building M, Colonel Samuel Smith Park Loop. A new peak period express service will be added. Northbound: Buses stop only at St. Clair Avenue, Eglinton Square, Eglinton Avenue (farside), Lawrence Avenue, Rowena Avenue, Ellesmere Road, Pachino Avenue, Sheppard Avenue, Finch Avenue, McNicoll Avenue, and Steeles Avenue. Southbound: Buses stop only at Steeles Avenue, McNicoll Avenue, Finch Avenue, Sheppard Avenue, York Mills Road, Parkwoods Village Drive, Rowena Avenue, Lawrence Avenue, Eglinton Avenue, O’Connor Drive, St. Clair Avenue, and Victoria Park Station. 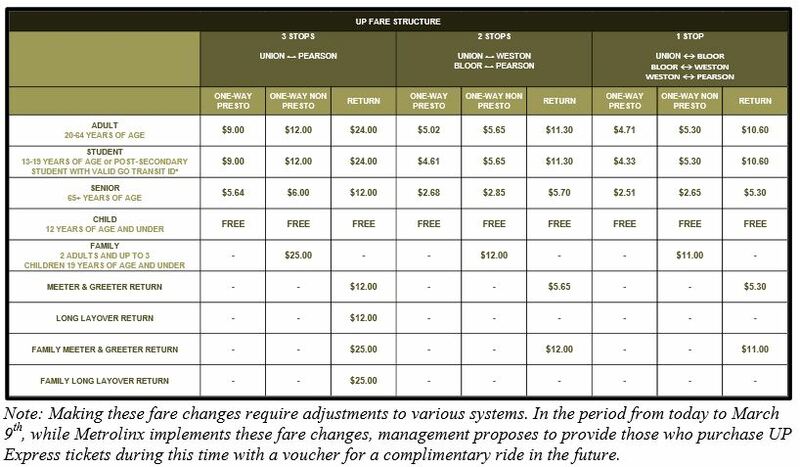 The Wilson route will be broken into four separate designations to simplify scheduling (eliminating interlining between some branches). The 96E Wilson Express to Humber College will be replaced by the new 186 Wilson Rocket. This route will operate during the peak periods and weekday middays (the 96E is peak only). Route 118 Thistle Down replaces the 96C service. Route 119 Torbarrie replaces the 96G service. Both routes 118 and 119 operate from Wilson Station during all periods. 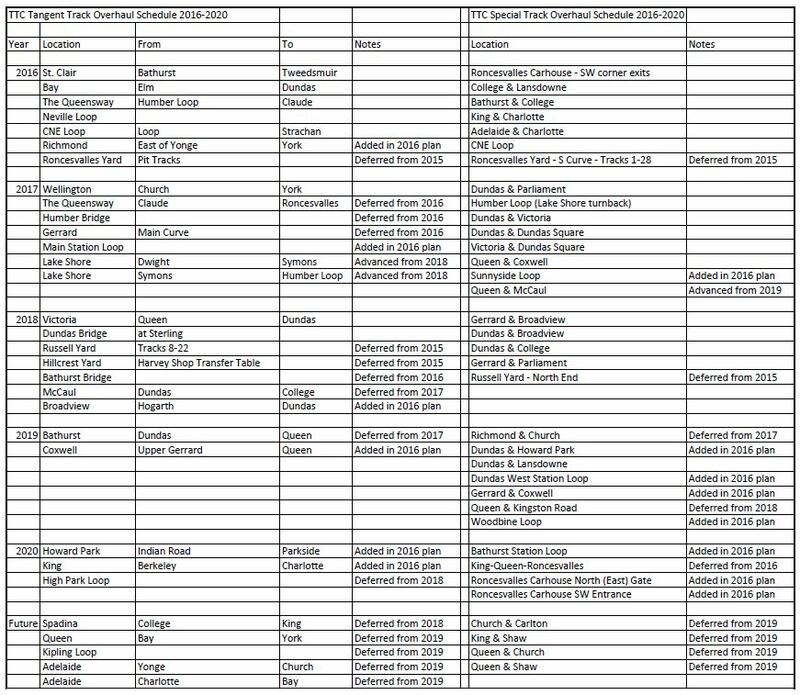 The 96 services they replace operated from York Mills Station during peak periods. 186 eastbound: Buses will stop at Humber College Bus Terminal, Westmore Drive, Martin Grove Road and John Garland Boulevard, Kipling Avenue and Brookmere Road, Islington Avenue and Elmhurst Drive, Armel Court, Albion Road and Weston Road, Walsh Avenue and Weston Road, Clayson Road, Jane Street, Julian Road, Keele Street, Dubray Avenue, Dufferin Street, Wilson Station, Bathurst Street, Avenue Road, and York Mills Station. 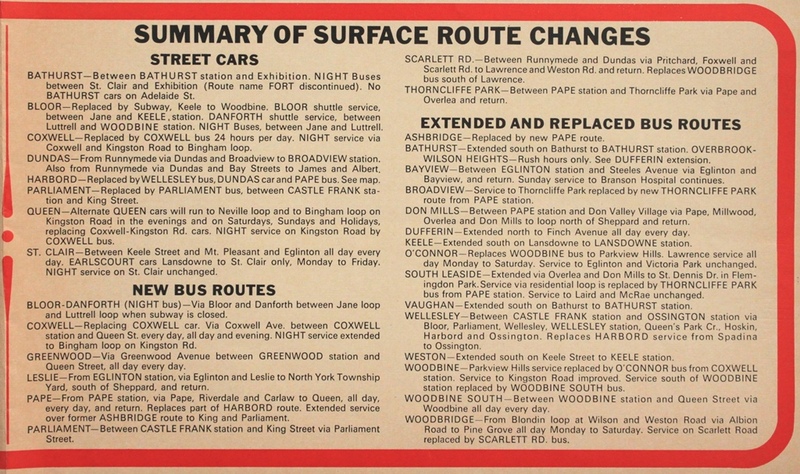 186 westbound: Buses will stop at York Mills Station, Avenue Road, Bathurst Street (far side), Wilson Station, Dufferin Street, Dubray Avenue, Keele Street, Julian Road, Jane Street, Clayson Road, Walsh Avenue and Weston Road, Albion Road and Weston Road, Armel Court, Islington Avenue and Elmhurst Drive, Kipling Avenue and Brookmere Road, Martin Grove Road and John Garland Boulevard, Westmore Drive, and Humber College Bus Terminal. Reconstruction of the north ladder tracks will require that cars back out of the yard onto The Queensway, loop west through Sunnyside Loop, and enter service eastbound from that point. Schedules for all routes based at Roncesvalles will be adjusted with extra running time for their departure trips. Track on Charlotte from Adelaide to King will be replaced. During this work, the 510 Spadina service that normally short turns there will be extended south to Queens Quay. Service arrangements for 504 King during the reconstuction of the King-Charlotte intersection have not yet been announced. This route will now be designated as a 100% low floor route. In the event that Flexitys are not available, ALRVs will be used in their place. Schedules will be adjusted to remove some of the extra running time that had been added for Queens Quay construction. Updated February 24, 2016 at 10:40 pm: A map showing the various options for a Pape-Queen routing to downtown has been added at the end of this article. The City of Toronto Planning Division has released the detailed technical scoring for evaluation of six possible routes for a Relief Line linking the core area to the Danforth subway. Of these, the two Broadview options don’t fare very well, and the real debate is between the four remaining Pape options. Within each major grouping of scores, the values were totalled and then normalized to the range of zero to one. For example, if a group contained 4 topics, then the maximum possible score is 16, and each alignment’s score is divided 16 to get a normalized value. This allows the scores from each group to be compared with each other. At the end, the scores can either be summer individually (each topic counts equally), or the group averages can be totalled (each group count equally regardless of how many topics it contains) and normalized. On a grand total basis, both the city’s technical evaluation and public feedback came to the same conclusion: even though there are variations between the four alignments, they all average out to a 3/4 score. The point scores also come out close to the same with higher values on one item balancing lower values on others for, overall, an even ranking. Quite simply, all other things being equal, the four alignments are more or less equivalent using this scoring system. However, the City opted for alignment B1 because, among other things, is is claimed to be cheaper and simpler to build. The ridership estimates are generally higher for the via King options, and higher still for the routes serving the Unilever site. In all cases, off-peak riding tends to be low compared to the rest of the network with roughly 2/3 of all boardings on the Relief Line being during the AM or PM peak. The effect is even more striking for configuration where frequent SmartTrack service at 12 trains/hour competes with the Relief Line for customers. This demonstrates the problem of a line aimed at primarily peak period “relief”. As and when we see projections for longer versions of the RL (to Eglinton or Sheppard), the balance of off-peak travel may change because the route will serve new subway territory, not simply provide an alternate route for existing trips. Despite the even scoring overall, the preferred corridor was selected based on giving some criteria additional weight as shown in the table below. This evaluation, like so much other recent work, depends very much on the presumed presence of frequent SmartTrack service in the rail corridor. If that is found to be impractical, then the relative importance of the RL changes along with its appropriate alignment to serve the core. This is particularly critical at the Unilever site which would have only SmartTrack serving it if the RL stays on Queen Street. One point above misrepresents the technical evaluation: both of the Queen Street crossing routes have the same cost estimate regardless of which route they take to the core area (Queen or King) and they share the same river crossing characteristics. 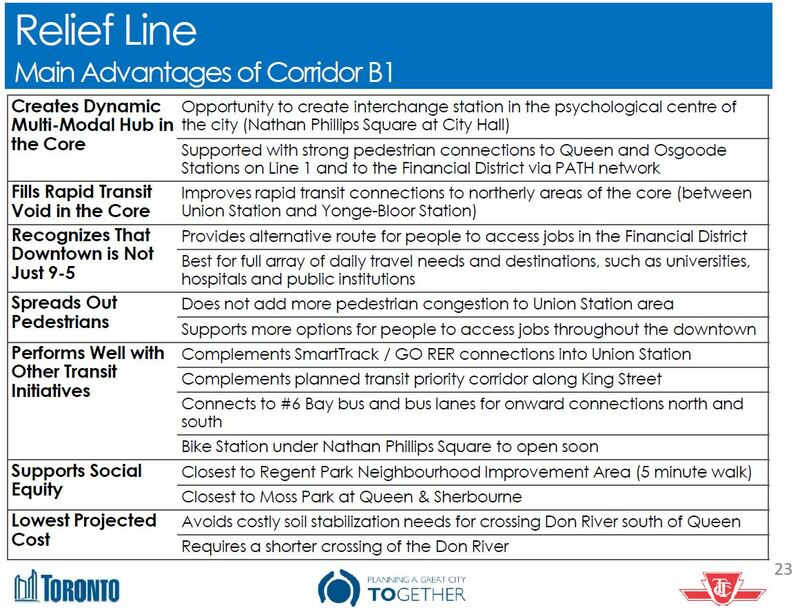 In summary, the choice “makes sense” in the limited context that a frequent SmartTrack service will actually be feasible and will be built. If SmartTrack cannot be provided on a five minute headway with a low fare, then the entire planning process will require a major rethink. Updated February 24, 2016: The following map shows possible alignments for a route from Pape & Danforth to the core area. Notes on the map talk of a track connection at Danforth to provide access to Greenwood Yard. 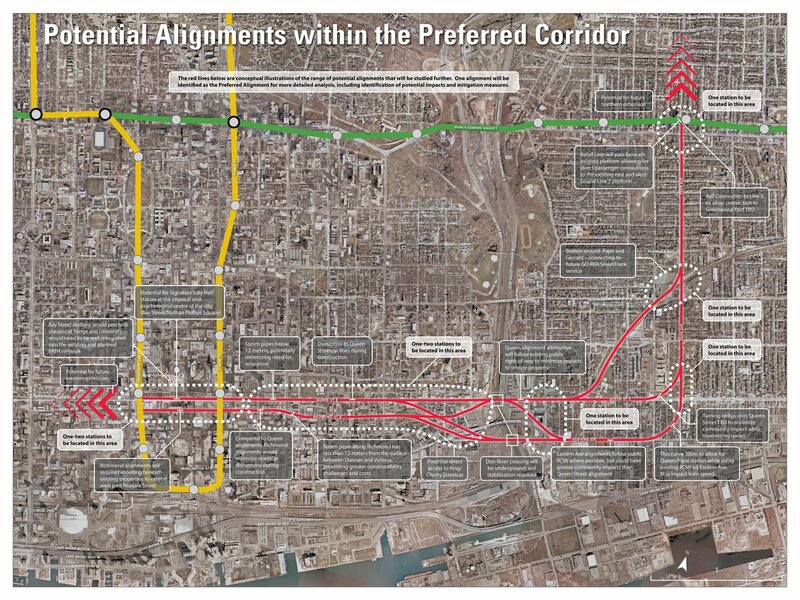 The technical scoring paper also mentions a southerly route under the rail corridor from Gerrard & Pape eastward. 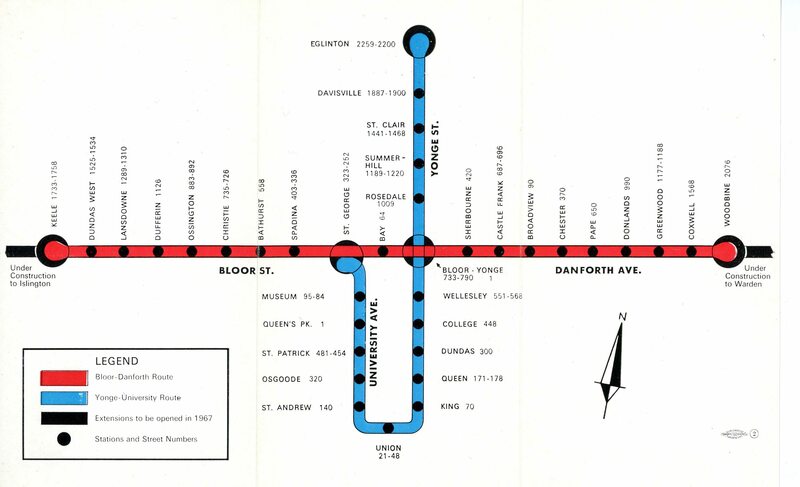 While this is longer, it would avoid the complexity of adding linking curves at Danforth. 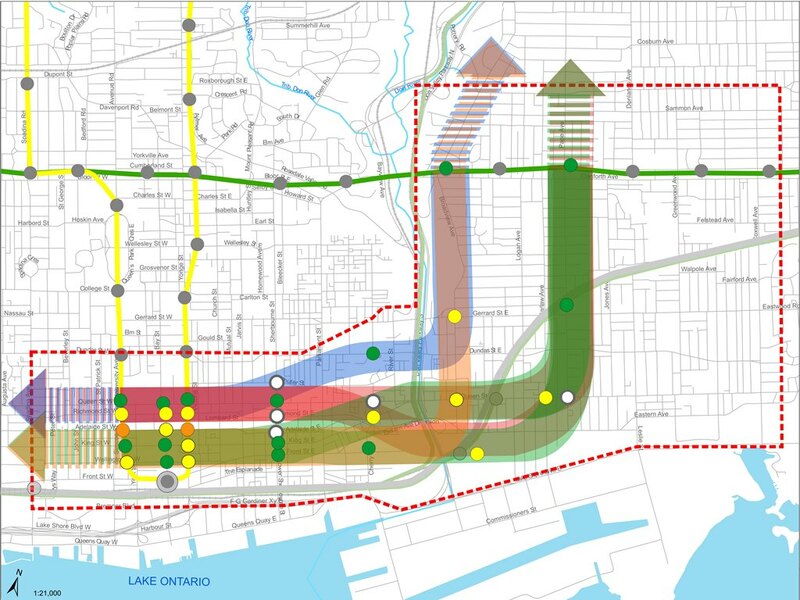 The new subway would bring major changes in travel throughout the transit network. 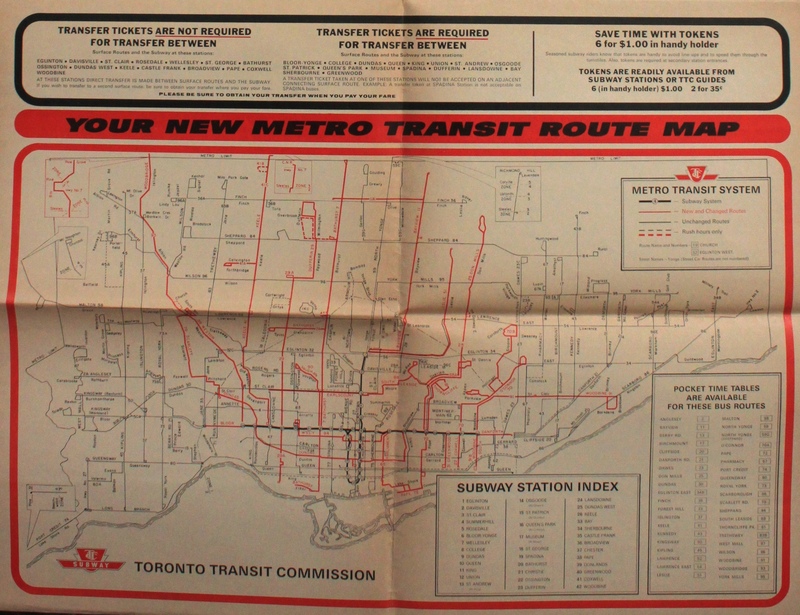 The TTC produced a large poster, the size of a two-page foldout in newspapers of the day explaining many features of the line and its operation. 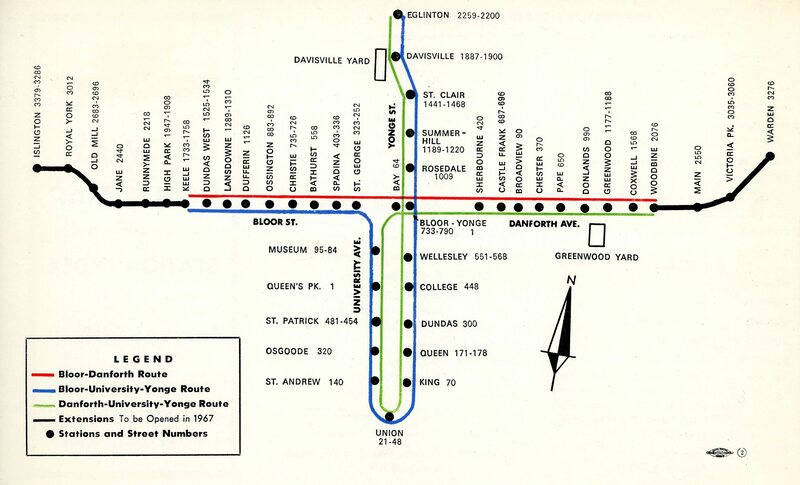 Probably the largest reorganization of routes in the TTC’s history accompanied the opening of the new subway including the change or removal of several streetcar lines. This was to be the beginning of a gradual dismantling of streetcar operation leading to the opening of a Queen Street subway in 1980. Lest passengers be confused about the destination of their trains with the integrated subway service, platform signs would indicate where the next train was headed. The signs remain on many platforms with their displays fixed to the now-standard destinations. 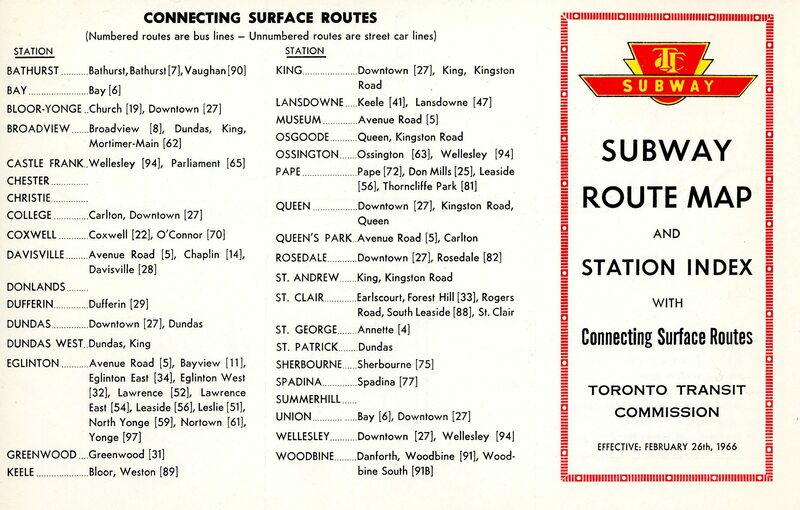 The two-zone fare system still existed, although its boundary would not be punctured by the subway until the extensions beyond the old City of Toronto opened. The fine boundary line is visible in the route map below. 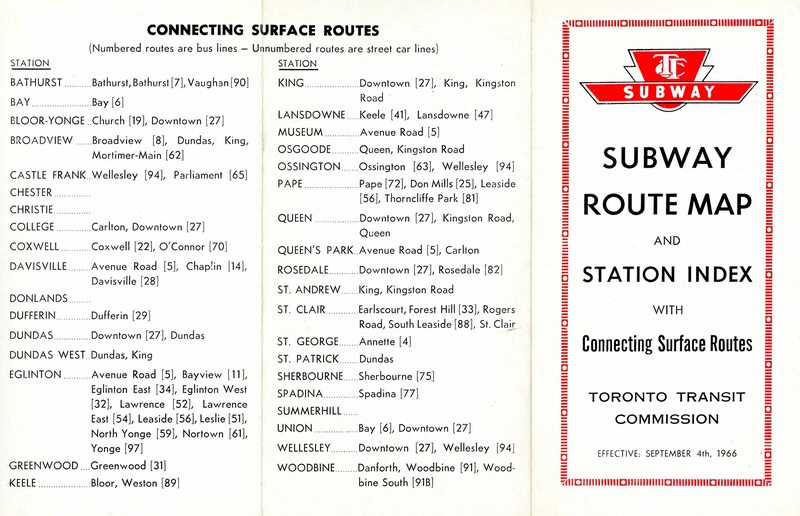 Adult tickets were still a common method of fare payment, and the TTC exhorted travellers to switch to the mode used by “seasoned subway riders”, tokens, at the princely price of 6 for $1 in handy cardboard holders. For the opening, a special commemorative token holder was issued. The subway had its own pocket route map. Six months later, this would change to the routes we know today. 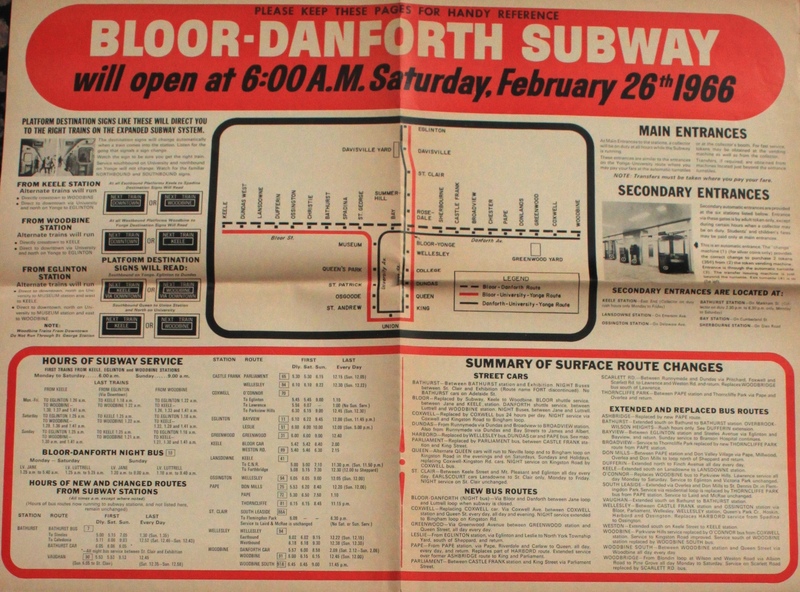 By mid 1964, the University subway had been running for over a year, and the Bloor-Danforth line’s opening was set for early 1966. Extensions to the east and west were already approved, although the Etobicoke segment ended at Montgomery Road on the east side of Mimico Creek. 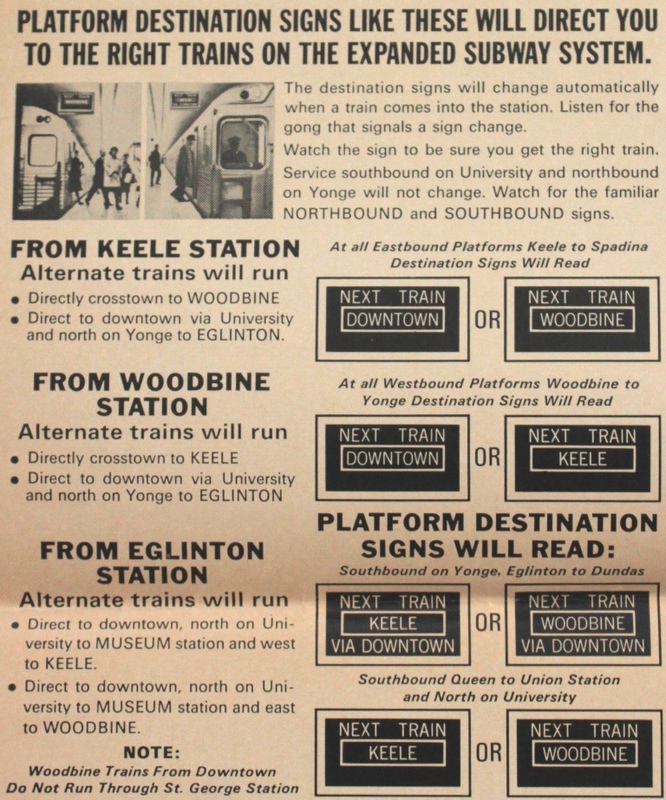 This would later be changed to Islington, and the stations at Prince Edward and at Montgomery were consolidated into a single stop at Royal York. With most of the line built by cut-and-cover, work was underway in many locations simultaneously, aided by the final added funding contribution from the Metro Toronto government. Unlike more recent projects, where political wrangling and tax saving measures dictated that construction run as slowly as possible, the BD line’s construction was a high priority in its day. Yorkville became the centre of Toronto’s 60’s culture, complete with an endless stream of tourists driving through to gawk at the hippies through closed windows. The name had such an unsavoury reputation for up-tight pols that in time the station would be renamed “Bay” with “Yorkville” as a subheading. Now it is one of the poshest areas in the city. A fleet of 164 subway cars was on order. These were the “H-1” trains as they would be known after their manufacturer, Hawker-Siddeley, at what is now the Thunder Bay plant of Bombardier.